Dr. George Hegge, my grandfather, died in a hospital at 12:40am on Wednesday, October 17, 2017 in El Paso, Texas. It was a week after he suffered a massive, and in the end fatal, stroke. All of our family made their way to El Paso as soon as we got the call with the doctors advice that the family do so. My sister flew in from Abu Dhabi, I drove in from LA, my mother flew in from Wyoming, and the rest of our family made their way from various parts of Texas and New Mexico. We spent a week in the hospital. From the opening of visiting hours to the close (and a little after), we took turns entering the ICU two at a time, as was the limit, to spend some time with paps, though he never regained consciousness after the stroke. When doctors confirmed he wouldn't recover, we wept and hugged as we had his ventilator and feeding tube removed. We waited to see if he'd stabilize enough to be moved out of the ICU to a regular room to pass, where all of the family could be with him at once. He did stabilize and was moved to a regular hospital room. A ferris wheel across the border in Juarez glowed outside his window as we sat beside him, an odd contrast to our reality. We took turns guarding paps after a young doctor entered the room early the first morning asking a few questions about how long paps had been unconscious before shaking him saying, "Wake up, George!" That was followed by a near constant barrage of other seemingly uninformed attendants suggesting we move him to a nearby hospice, a woman bringing in a meal tray, and a few more attempting to give him physical therapy and one trying to teach him how to use some sort of breathing aid. All of this came within 14 hours of being in the room, the majority of which were overnight. We asked the charge nurse to put up a sign to stem further insult, seems as noone entering the room seemed knowledgeable of my grandfather's condition or reason for being there. That evening, we spoke of the possibility that our constant presence might be preventing him from letting go. We decided against having family stay with him, something we'd done the night before, and went back to the hotel to try and sleep. We awoke to a call at 1:40am to get to the hospital. We dressed in a sleep driven daze and hurriedly drove to the hospital, taking the elevator to paps room. The door was ajar with my aunt and grandmother on either side of the room, paps quietly between them. "He's finally at peace," grandma said. After all the family had made it to the room and had a moment with paps and with themselves, we made our way to the lobby of the hospital, tired and in our own states of processing. We shared stories about paps and spoke about what was next, eventually making our way back to our hotels to try and sleep before reconvening for breakfast and heading back home. It was a hard week. Saying goodbye to my paps has been a hard process. But his story was much richer than those final days in the hospital. My paps was the youngest of 11 children that survived to adulthood, raised on a family farm in North Dakota. In college, his friends often referred to him as "Gorgeous George." Speaking of his bulbous nose, he'd remark that "all famous people have big noses" before listing off a few as evidence. He graduated school with a doctorate in dentistry, a professional practice that was his mainstay for a some years before he slowly phased it out, committing fully to a ranching life. During the last conversation I had with my paps, I asked him when that change had come; when did he realize he wanted to be a cowboy? His retort was short. "I always wanted to be a cowboy." Besides raising his own four children, paps played a part in raising all of his grandchildren and even some great grandchildren. Whenever any of the family was in a rough patch, paps was there for support. Most summers you could find a grandkid staying with paps, working on the ranch, learning hard labour and life lessons. I remember asking to work one summer with another of my cousins. "One boy is worth half a man; two are worth none," he said. 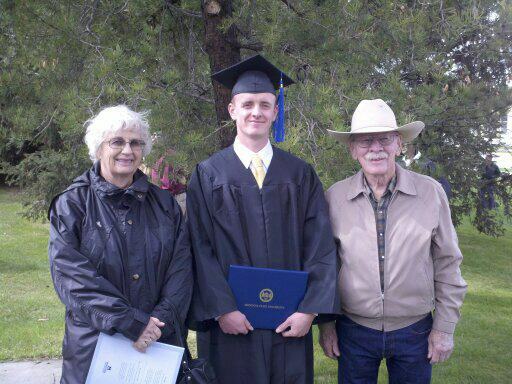 Paps and Sydney at my college graduation from Montana State University in 2012. He was always there for our graduations. Paps had a terrible mumbling problem. God forbid you got a phonecall from his cellphone, a connection that often relied on a rough cellphone antenna booster. If it was hard to understand him in person, it was near impossible over the phone. One can only wonder how many conversations people awkwardly laughed through with paps as they wrestled to understand what he was saying. His deep chested chuckles were universally understood and loved, though. It seems almost every summer of my childhood was spent in North Dakota, visiting grandma, his former wife, in Williston, and spending time with paps on his ranch near Marmarth. The drives were always an adventure of sorts, spending countless hours in a hot car, wandering through the badlands towards paps ranch. Ill-fated shortcuts and wrong turns on nameless roads often meant an additional half hour or more as we made our through the final, barren stretch of dirt roads towards his ranch. The oil derricks spotting the hills were always a tell-tale sign we were close. I remember the old weathered wagon wheel gate to his yard, the rickety metal spiral staircase that led up to the loft in his house, learning to ride horses (Charlie was my favorite), bottle feeding baby cows, chasing toads under his porch (I thought they were frogs until I got within arms reach). I can still feel the cold shock of the river water as I splash around in my whitey tighties, the only pair of underwear I happened to pack. I remember a rainbow across a canyon, purple thistled weeds pricking at my skin as we stop and stare for a while. My cousin tells me there's a pot of gold at the end of it. Paps wedding to grandma Sydney is one of my favorite memories. I got to dress up just like him, wearing my own straw cowboy hat and black cowboy boots. I was the little ring bearer. My cousin guided my horse and I in and I handed them their rings on a little pillow I was holding. Later that night I'd be decked in the eye by one of my newly minted cousins and become embedded in family folklore for urinating on my uncle's leg as we took a bedtime bathroom break in the woods. It feels like someone's stolen a piece of my puzzle. There's a painful gap in my heart. 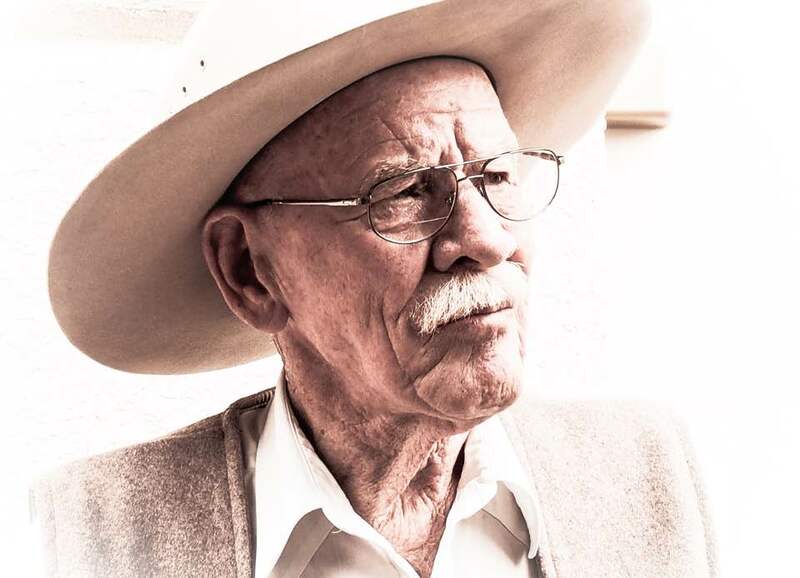 I can't fully grasp that I'll never see him wander in the door wearing one of his cowboy hats again or hear him chuckle at another one of his own jokes that I couldn't quite make out. My chest tightens up when I think about the fact that I won't get another one of his world famous bear hugs – a tight hug accented by a gruff growl. 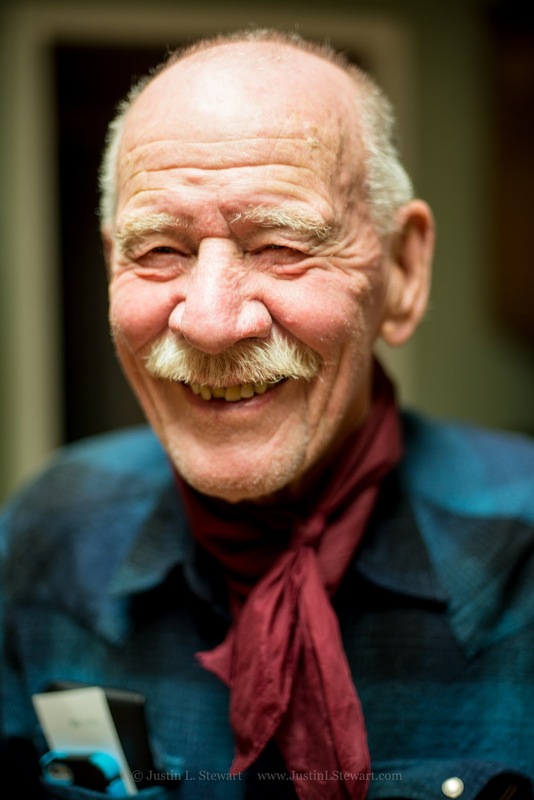 I'll miss that big bushy mustache, those squinty eyes, and that sly smile. I do miss them. When I think of him now, I try to think of one of those warm summer evenings, gently winding through the hills on a dirt road in his old red truck, the window rolled down as he smokes a cigarette. He's not saying anything, just driving. The sun is gently reflecting off his white cowboy hat, the seat softly squeaking as we roll along. He pulls over to open a fence to a pasture where we drive a little further to a spot where a herd of his cattle are grazing. As we stop, I climb into the bed of the pickup truck where I watch him grab a handful of treats out of a bag. He walks out to the cattle, feeding them treats one by one as he quietly talks to them. I can hear the soft hum of crickets and the subtle swish of grass as the cattle feed and the light slowly fades. There's no pull to be anywhere else, just a sense of peace as I watch him go from cow to cow. He's happy. Everything is as it should be. What will my family do after my death, an important question arises in every mind. If I wants to save my last words and wishes at the time of death. We need solutions for securing final legacy as last message for my loved ones is important. To secure my last words, I utilize services of last whispers, do give it a try.